Important Note: This is not a public sale. 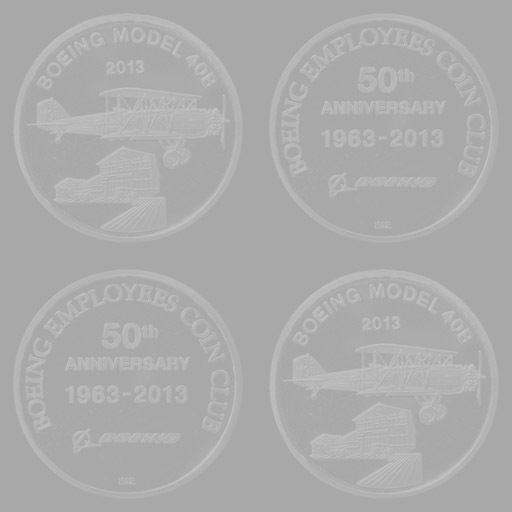 BECC medals are normally sold to eligible Boeing persons by private sale. Please read "BECC Medals Information" below. 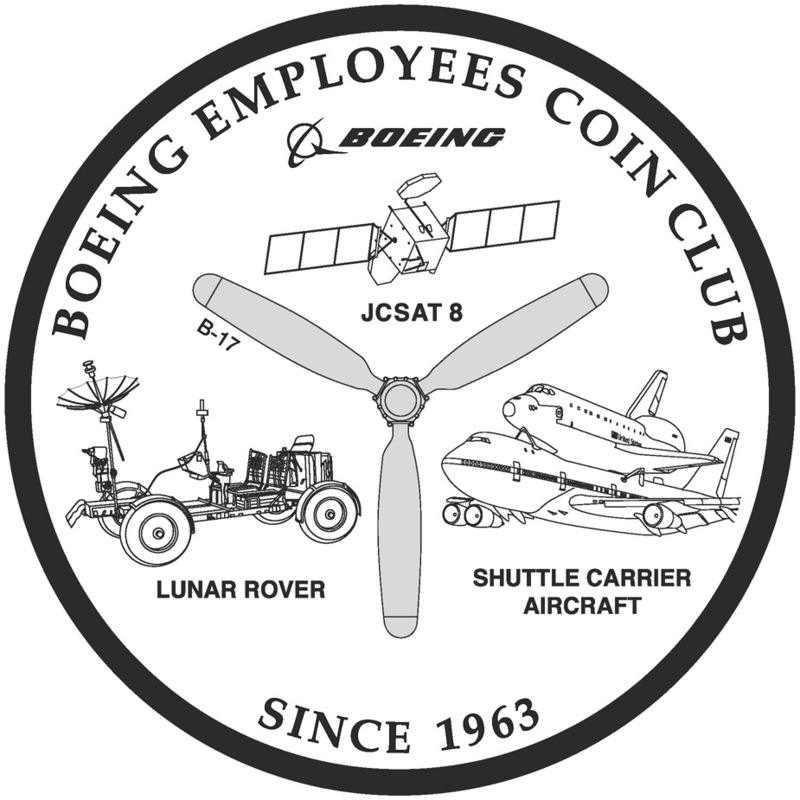 The Boeing Employees' Coin Club has issued distinctive medals featuring a Boeing product or products most years since the 50th anniversary of The Boeing Company in 1966. 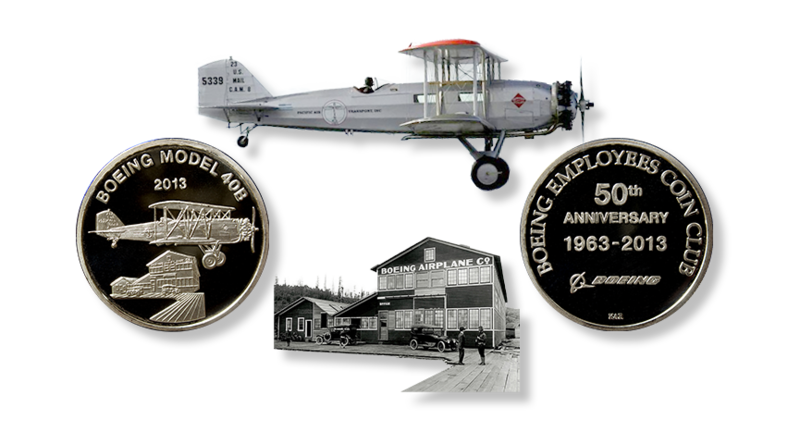 These medals are issued in silver, pewter, and bronze (and beginning in 2012, copper), with a proof-like (mirror-like) finish, and are widely collected by BECC members, Boeing employees and retirees, and other persons interested in aviation and coin club memorabilia. Since the BECC is a non-profit organization, the medal prices are reasonable, although higher in recent years due to higher silver prices and higher production expenses. Note: The 2012 copper medals did not have a proof-like finish, however all other medals including the 2013 to date medals do have this popular feature that most collectors desire. Special "antique" finish medals have been made for club awards, but are not available as part of the normal sales process. More information about recent special-issue medals will be available in 2019, including in the PNNA's first quarter edition of The Nor'wester, which was available at the annual BECC coin show. Important Note: This information is not guaranteed and may not be up-to-date. Please contact the medals chairman or medals sales coordinator for more information, or inquire at becc.medals@gmail.com. All past BECC medals are SOLD OUT (from the club), except for a limited number of 2014-2019 dated medals. 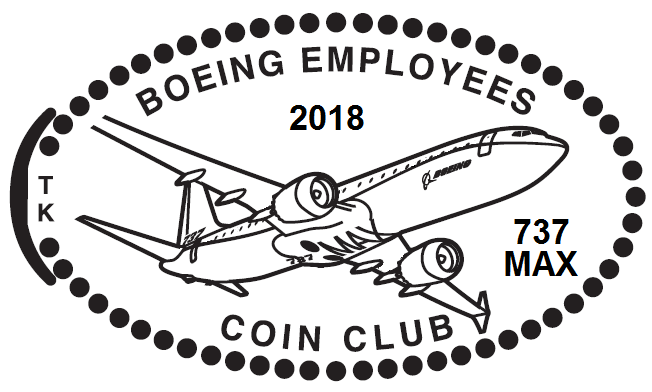 2019 medals were available to club members and Boeing persons via the official order form, which was published in the club newsletter in the summer-fall of 2018, or could be obtained from the medal sales coordinator. See below for current status. Note: Image in center is elongated cent design for coin show. Artwork © 2018 The Boeing Company and BECC. All Rights Reserved. At the May 2018 meeting, Tom presented important statistics on World War II P-51 Mustangs & Aces. 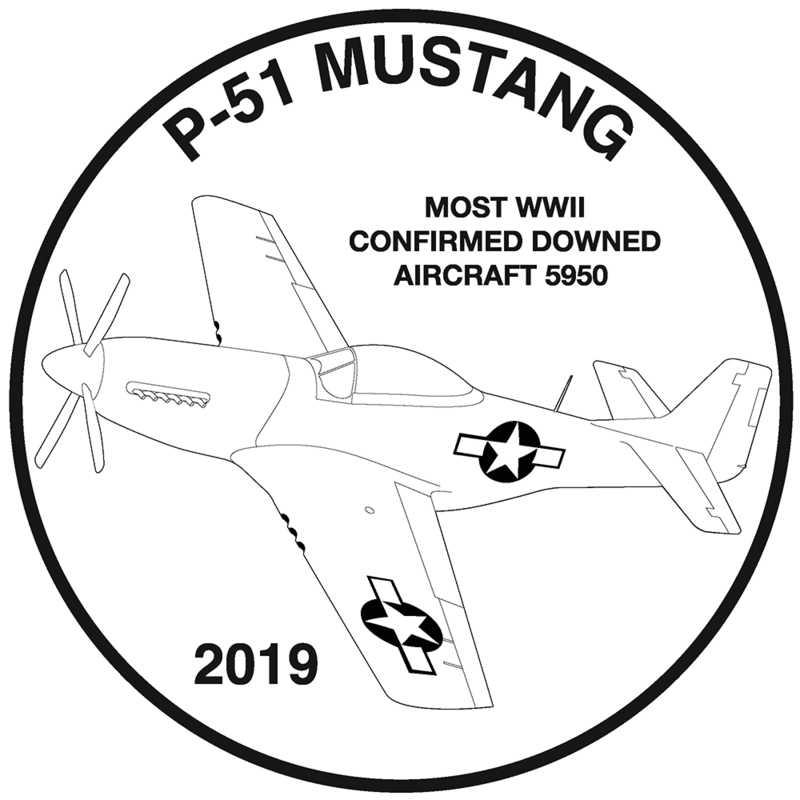 Craig made a motion that the 2019 club medals depict a P-51 Mustang, which was accepted. 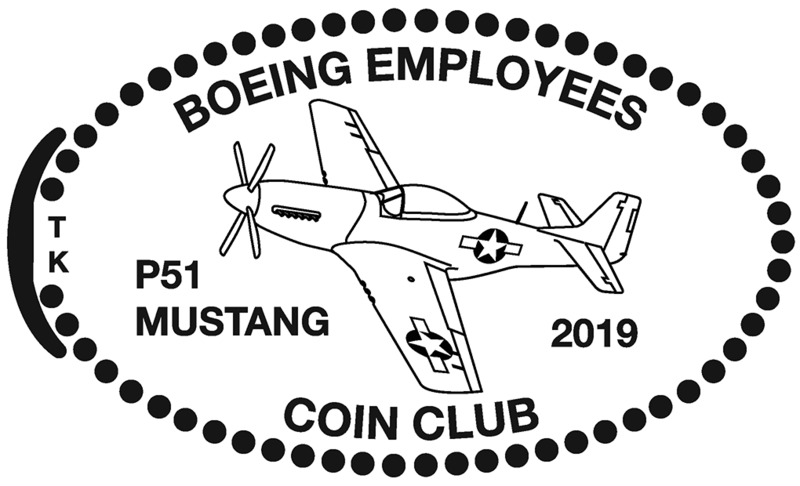 July update: Tony has ordered 2019 BECC Medals, featuring a “killer” P-51 mustang. 200 silver, 100 bronze, 100 pewter and 25 copper. September update: The 2019 medals are due to ship from the mint. Once the package contents have been confirmed, we will start shipping the medal orders that do not contain the custom holders (i.e. 3 piece holder/set and mirror base holders). October update: The 2019 medals are in and looking good. Sales are doing well with more than 70% sold. Last month I inadvertently said we had 115 bronze and pewters minted. That was wrong - we only had 100 minted. So the correct minted quantities are Silver (225), Bronze (100) and Pewter (100), with quantities currently remaining of 31 silver, 27 bronze, and 31 pewter. I am currently looking for a new source/supplier for the custom medal (and awards) holders. At this rate I don’t expect to have the awards for the chair positions that we normally hand out. As soon as we can get the holders I will get those distributed. I will have the antique bronze medal at the banquet so people can view it. Single medals and orders that do not have custom holders will be going out in the mail this week. As soon as I have the custom holders, I’ll start mailing the 3 piece holder sets. Artwork © 2017 The Boeing Company and BECC. All Rights Reserved. 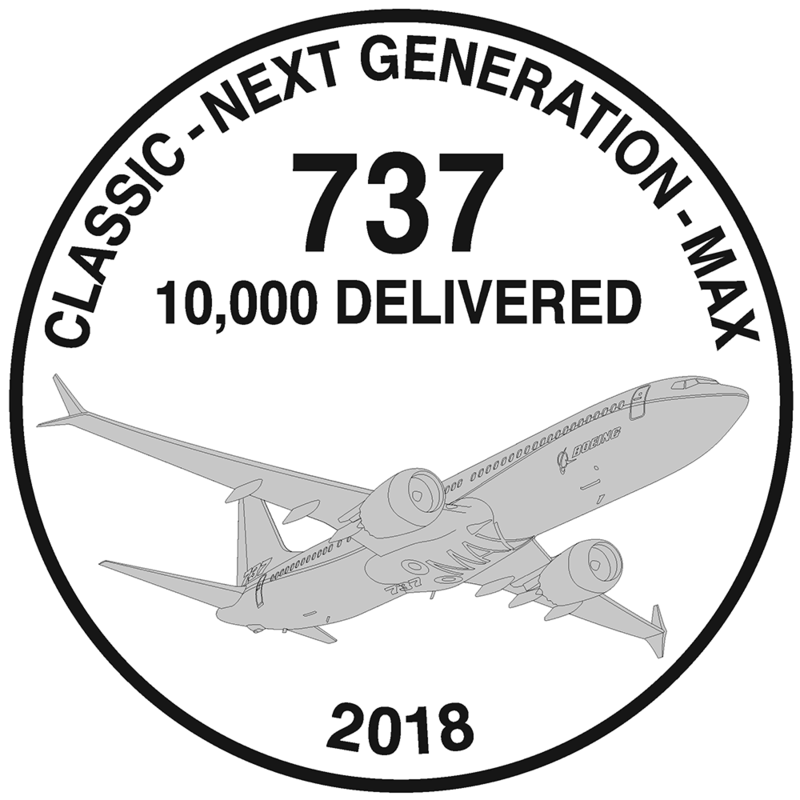 April/May 2017 update: Progress is being made on the 2018 medal design to commemorate the 10,000th delivery of the 737. At the March club meeting, we reviewed 8 different design and then down-selected to two designs. Upon further discussion, the club decided to vote on which plane graphic they preferred and that the wording option would be voted on at the April meeting with a selection of different text options for the medal choices. The airplane design shown won the club’s approval. More style (text) options will be created and made available at the April club meeting for voting. Tony K. presented 10 different options for the 2018 medal design with a variety of options showing different text positioning. After two rounds of voting, the design for the obverse was decided, and will be sent to Boeing Licensing for approval. June/July 2017 update: The design has been approved by Boeing Licensing and BEX is working on the getting the die made to produce the medals. BEX has been informed of the club’s decision to stay with the proof-like pewter medal, so the price of the pewter medal will increase to cover the additional minting cost. The cost of the die went up an additional $50 as well. The board reviewed the pricing of the medals and agreed with the following prices for the single medals: Silver ($45), Bronze ($13) and Pewter ($16). The price of the three-price set will remain at $90. See the 2018 medals order form in the newsletter for the other pricing. It was also shared at the board meeting that BEX will starting striking the medals and we should have them by the end of the July. Holders have been ordered based on 2017 sales and should be ready close to the same time. September 2017 update: Current status of the 2018 737 10,000th delivered medals for Sept. has the inventory at 148 silvers, 74 bronze, and 81 pewters remaining. The current sales have been for the folks receiving the newsletter and/or the email order form. The folks that get the order form by mail received their order forms last week. Once those orders come in, we should be close to selling out all of the silvers. The 2018 medals are also being shown at the Boeing Family days. If you recall, we auction off 3 copper medals at each club meeting, while I forgot to bring the 3 for the August meeting. The board decided that that those 3 would be auctioned off at the November meeting and that we would not be auctioning off 6 at the September meeting. Still to be auctioned off is the pair of 2017 747-8 pewters proof-like (mintage 110) and the brush finish sample (mintage 1) in a custom holder. That set will be auctioned off either at the November or December general meeting. A picture of the set will be posted in the newsletter giving the auction notice. November 2017 update: We have less than 40 silver, 50 bronze and pewter medals left. The club was asked to write a article for the PNNA newsletter (The Nor'wester) for first quarter 2018 in time for our coin show. Tony will work on that article. Feb.-Mar. 2018 update: Quantities of 2018 medals remaining are: silver 35, bronze 46, pewter 46 and copper 23. The coppers are being auctioned off at the rate of 3 per meeting. 2 were given away at the banquet. All past BECC medals are SOLD OUT (from the club), except as noted above. Table of BECC medals (designs and mintages). Table of BECC medals issue prices. Medals Frequently Asked Questions (FAQ). Also see below for links to details of recent past medals, and photos of current and past medals. Medals are available for purchase until sold out (or until otherwise decided by the board), by persons eligible to participate in the Boeing recreation program (employees, retirees, on-site customer, vendor and government personnel and certain family members). The BECC reserves the right to change prices and limit quantities of medals for sale (including the quantity that may be purchased by each buyer). The information on this page is not guaranteed to be accurate or up-to-date. BECC club members receive an order form with their newsletters each year, usually no later than September. Mailings will also go out in September to recent previous purchasers of BECC medals. Other Boeing employees and persons with a Boeing badge can contact the medals chairman listed below. All orders must be submitted with an official order form. Persons who are not eligible for the Boeing recreation program, or who wish to purchase medals after the ordering deadline, cannot purchase medals directly from the club, but may be able to purchase medals on the secondary market from club members who purchase medals for resale. The BECC has produced over 50,000 (now 70,000) medals since 1966, and has commemorated that event. Past BECC medals can often be purchased from dealers at the BECC's annual coin show in January. To inquire about the availability of medals, please attend a regularly scheduled BECC meeting, or attend the BECC's annual coin show in January. BECC Medals Co-Chairmen: David E. Buehler and Anthony Kalt, or inquire at becc.medals@gmail.com. Medal Sales Coordinator: Please contact David. See the BECC Officers Page for current contact information. 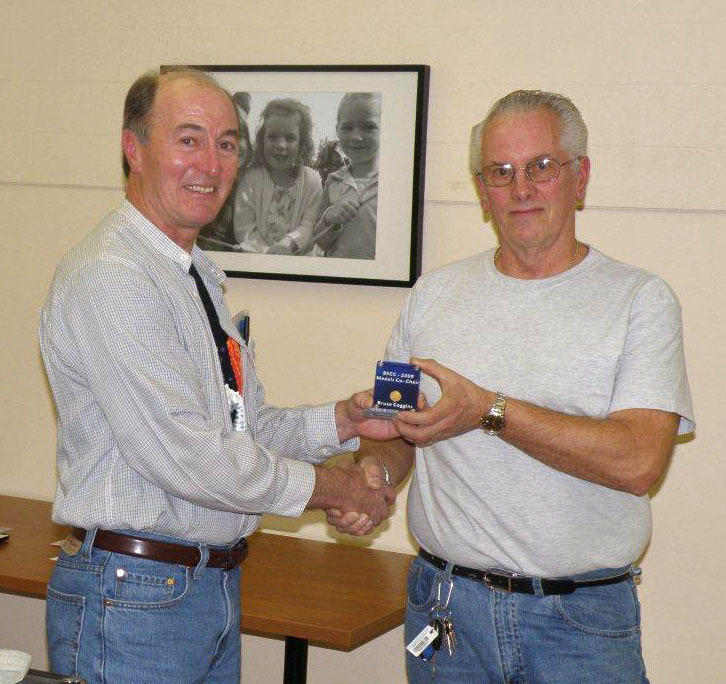 Photo: Greg Smith (left) presents award of a gold coin to assistant medal sales coordinator Bruce Coggins. Bruce put the sets together for many years starting in 1994. Greg handled the order forms and the mailing of the medals in some recent years, before he was elected as club president! Once you are on one of these pages, you can also navigate "previous" and "next" to see the other years.